Embedded World, Nuremberg, Germany—February 26, 2013— Today, IAR Systems® announces further enhancements to its innovative Power Debugging technology. At Embedded World in Germany, the company demonstrates new functionality in its world-leading development tool suite IAR Embedded Workbench® for ARM®. 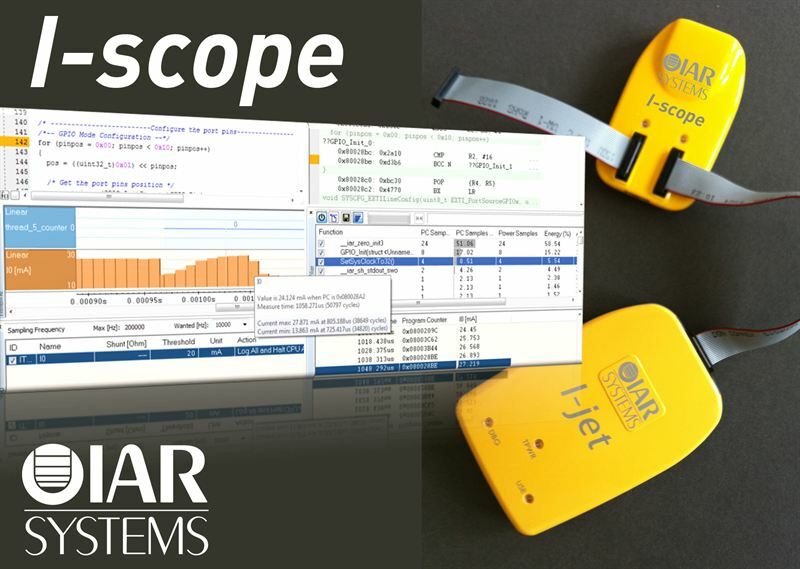 This functionality includes detailed in-circuit power measurements made possible by IAR Systems’ new I-scope™ probe. Power Debugging provides developers with information about how the software implementation of an embedded system affects the system’s power consumption. This technology is available using the C-SPY® Debugger included in IAR Embedded Workbench together with IAR Systems’ in-circuit debugging probe I-jet™. By adding I-scope, developers can gain knowledge of the power consumed by individual modules, detect if design flaws in the code are causing unnecessary power consumption and possibly extend battery lifetime. At any designated point on the target board, I-scope can measure current and voltage with 12-bit resolution at a sampling rate of up to 200 kHz. The information is transferred to I-jet, which synchronizes the data with the running program counter, enabling it to be graphed in real time and analyzed using the C-SPY Debugger. The analysis can be used to reveal the power consumption of individual functions and peripherals, which I/O activity causes current spikes, and how much power is consumed in various sleep modes. I-scope is designed to be used as an extension to I-jet and will be available for delivery in Q2 2013. IAR Embedded Workbench is a complete development tool suite with support for all ARM cores. It features all the tools needed to develop high-performance embedded applications, including the powerful IAR C/C++ Compiler™ and the comprehensive C-SPY Debugger. Download free evaluation licenses from www.iar.com/ewarm.